How Do I Get My Teen Into Therapy? I know something is troubling my daughter, but I can’t seem to get her to talk about it. Q: My teen daughter has been really moody lately, which just isn’t like her. I’ve tried getting her to tell me what’s upsetting her. I even suggested I could take her to a teen therapist, but she didn’t like the idea. How can I get her the support she obviously needs? A: Before sending your son or daughter to counseling, it’s best if you first get together with me to discuss your concerns about your teen. 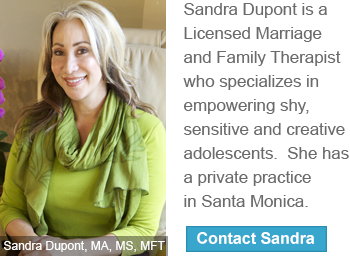 As an experienced professional, I can think together with you about the challenges your teen is facing, as well give you ideas on how to make the idea of coaching or counseling sound less stigmatizing and scary. If the thought of reaching out to a professional feels intimidating to you as the parent, imagine how your teen must feel about the idea of sharing her personal concerns with a stranger. By your going first, you can pave the way, and also learn how to help your teen feel better supported at home. Although the inclusiveness of elementary school children may have shielded some teens from the pain of social rejection, in middle school, your teen will need to learn new coping skills in order to thrive. Typically, before your teen is able move forward with learning goal-setting, time management, and social skills, they need to learn the tools on how to respond to criticism, disappointments, and change.